This app is starting to fail with regularity... it used to be the best available in its category, but no longer. Time for a refresh? Please? This app is so customizable and comes with a good collection of news sources to draw news report audio from. And if you have a specific source you would like to add to your collection, you can! Albeit, for a buck but hey, it stays with the app once and for all! Thank you people who made this, you help me keep up to date with global matters and local matters in a fantastic format! I only review apps that I find nearly indispensable, this is one of them. Used this app for many years. When the feeds are updated in the background it sometimes triggers the news to start automatically. Very big bug if you’re in a professional setting and your devices start blaring hourly news updates. Can’t open it after update, it crash on opening. Get only black display. Looking on the last update, it was about year ago, so no wonder. Clearly the developer stoped supporting it. Listen to a wide variety of radio news sources for summaries of the day's news. You choose which ones to play and how much to play. Listen to one source or many. Most sources are updated hourly; a few - like New York Times in depth feature - are updated daily. Great for news junkies. Over a dozen news sources including: NPR, VOA, BBC, ABC, CBS, FOX, and more. It always works well. Over the last couple of weeks. I’ve been awoken by this app at 3 am. It just starts playing on its own. Was good. Now it has adds. This app used to be good because it didn't have adds between news stations. I purchased the app for the sole reason that it didn't have Adds. Way to ruin a good app. I LOVE the I formation that Hourly News provides in such a convenient, succinct manner. However, I believe captions are necessary. My best friend is def and cannot use this app. Also, many people o show the app have had trouble enjoying it because "they speak too fast." I love getting the news this way — until it goes over to CBS News. Two-thirds of the way through, several extremely irritating ads start blaring away. They’re always the same ads! Ads don’t belong on this app! That said, I’m told that CBS has itself added the ads. But I have been given no instructions on how to contact CBS News! I love getting the news this way — until it goes over to CBS News. Two-thirds of the way through, several extremely irritating ads start blaring away. They’re always the same ads! Ads don’t belong on this app! It allows me to skip reading news online which is a big time waster for me. The app crashes every single time on iOS 11 with an iPhone X. It also hasn’t been optimized but the crashing has been happening for months. Update: I contacted the developer, who was very responsive. The issue is a bug relating to a popover about custom sources, he says, and I expect a fix will be out soon. I’ve changed my review to 5 stars from 2. And I’m OK with a few commercials every once in a while but the ads from “indeed “and “trip recruiter “have turned me away from this app. Those type of repetitive and high-pressure sales advertisement have a tendency to lower the professionalism of great news apps like this one. The app crashes every single time on iOS 11 with an iPhone X. It also hasn’t been optimized but the crashing has been happening for months. Why is Foxnews still playing that stupid ad about an October 24th market change!!?? I like this app as it's easy to use and plays my favorite new shows consecutively. I would definitely recommend this App to others who enjoy listening to the news. Great to use when doing lengthy tasks around the house. One newscast folds into another, with cast order rearrangeable. The app does need a way of replaying the last 10 seconds and a way of moving the newscast ahead by dragging the playhead. Also the list of radio sources is skimpy. A much larger list should be available with the paid custom source option. I depend on this app daily to keep informed about the latest breaking news. It's an excellent app to start your day off and receive a quick glimpse of the world. One of my "Go to" Apps. A great way to get the latest news and an app that I use almost every morning while making my coffee and breakfast. Easy to use once configured. Great see custom feed capability has been added. Looking forward to checking it out. Thanks for updating! Any troubles in using this app, for me, have been feed and/or internet connection related and not fault of the app. At the gym in the mornings it just plays through all my favorite stations and I get the news I need with no fuss. 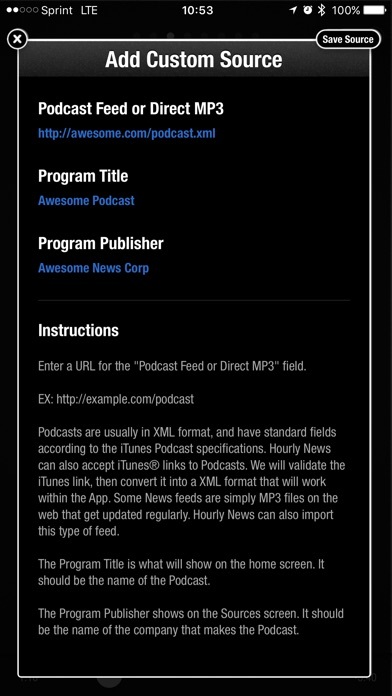 I can add podcasts easily and this app makes it very easy for you to access the news you need. Simple and intuitive. 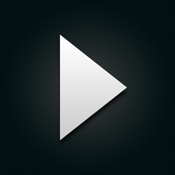 I would add another star if the interface were somewhat slicker and not just black with a play button. There is beauty in simplicity. I want to hear a quick rundown of the most important news from different perspectives. This is a great app for this purpose. Nothing beats it. I've been using this app for over 2 years. Easy to use! 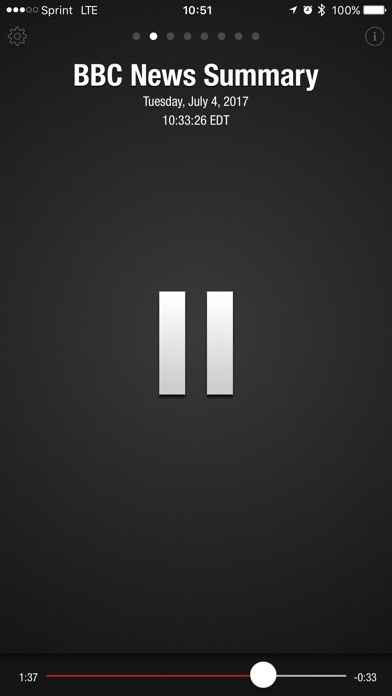 I listen to the news at least twice a day on it. Gets podcasts that are not available on stitcher. Everything I need to know when I need to know it from multiple sources. I like this app a lot; it is frustrating however that some broadcasts suddenly stop in mid sentence and jump to the next. Occasionally, some broadcasts just don't turn on. Wonderful app with a goodly number of news feeds available. I don't believe there's anything else quite like it in the App Store. Latest update (1.7.3) further improves the opening speed of the news selections. Unfortunately, more commercials on some of the feeds have lessened an otherwise positive experience. Have had this app for years! My only wish is that developers would stay on top of updates for compatibility. For the last several months I've had issues with delays and playing the sources, and received messages saying the app was having compatibility problems. I'm hoping that's resolved for now. Thanks for a great app otherwise! This is exactly what I want and need with regards to world news. conection not smoth, content great ! A must in my morning walk. I love it. I can hear different news outlets and get different points of view. All in one app. I stumbled upon and listen to it every morning. It's short and sweet. This app is of abundant news and effectively designed. Also, it is convenient to use. Loads fast, concise. Use it 3-4 times in a day. Love it. Love this app to catch up with the latest news from a variety of sources. I listen each morning during my workout. Disappointed that BBC seems to have discontinued providing a segment. Would be valuable if more news services were available. My go-to hourly news app! I've enjoyed for several years now having a convenient way to audibly scan a cross-section of breaking news. Helps me avoid the single-world-view trap. I'm so glad they've updated it to keep it current with Apple's iOS changes. Convenient source of audio news updates from multiple sources. *Quick note to developer: Please add Apple Watch compatibility, thx! 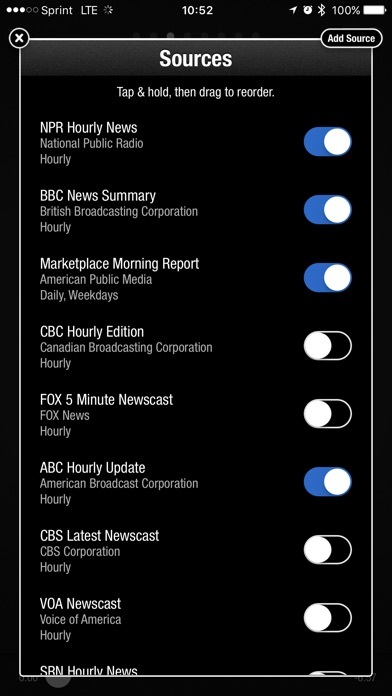 * Hourly News is a dead simple way to hear current audio news reports from multiple sources without having to mess around with your iOS device. 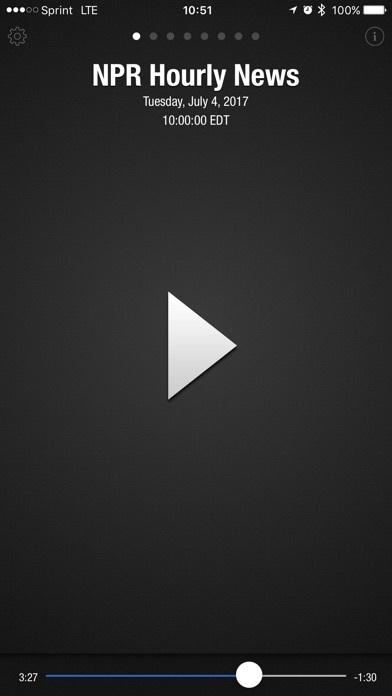 Each stream just plays automatically in the sequence of your choice. I chose NPR, BBC, and The Daily (from NYTimes). If I have time I listen longer (to DW, Marketplace, Fox, and RTHK). It's always enlightening to hear the different perspectives back to back. So thankful the developer updated this for iOS 11 because I've been using this app for half a decade and haven't found anything else like it. This is the best news radio app available. A must get! Strong selection of sources, including the NYT's The Daily. Have noticed that opening the app does not reset a previously played source such as NPR, especially. I originally wrote this four years ago. Still true. A news shot when you need it. Perfect. Abso-freakin-lutely AWESOME. One of about a half dozen apps I use every single day! Perfect app for starting the day! Gives you an instant synopsis from multiple sources. While it has occasionally experienced some glitches, the developer has done a good job to update and maintain the app. I don't need custom sources, but will probably buy the feature just to support the developer. Easy to use, does it's job really well. A convenient way to start the day with your preference of news sources. My only criticism: Updates slow in coming. My version started slipping from one podcast to another, before each was complete(while my Iphone warned that the app version needed to be updated). Eventually, the app must have been updated, because it stopped skipping through the podcasts. Does what I want it but a revision or something changed the time bar. I can’t move it to where I want it. It’s sketchy and will move but usually not without swiping to the another news podcast. A great way to get key news bytes as I start my day. I especially like getting news stories from a variety of sources. Really love this app, listen to it every morning, but for some reason the BBC has its volume way down and I can barely hear it trying to listen to it in the shower, while the other ones sound just fine. I can’t believe I took so long to give up on this app and just start playing news on my podcasts app. I used this app for at least a year, and it frustrated me every morning. 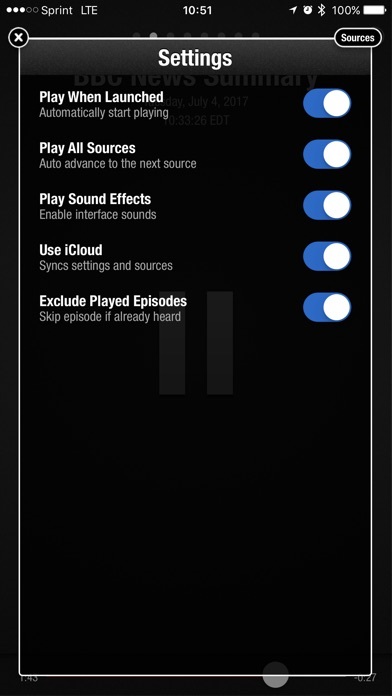 ▪️When connection is too slow to support the podcast (which happens FAR more often than when I use iPhone’s built-in Podcasts or any other app), it doesn’t simply stop, to start up again when the connection catches up (which makes sense and is the feature for almost any audio or video stream you’d normally access). Instead, it either rolls automatically to the next source or stops completely and goes back to the beginning of the current source. ▪️When that happens, good luck trying to find the point 2.5 minutes into the source you were listening to. The tiny(!) slide that controls your progress in the source is completely insensitive to touch control, either refusing to respond at all or jumping much much further than you’d ever indicated. The size of the slide controller alone is a very basic UI design fail for an app whose sole purpose is user convenience. ▪️The lack of control over progress through each source means that you have to sit through commercials, and, if you didn’t completely absorb what was just said, there’s no going back. Meanwhile, the Podcasts app has had a simple 15-second jump so that you can easily skip over commercials and have them repeat the last tiny bit. ▪️There’s no longer any way to get BBC’s hourly news anywhere but the BBC iPlayer Radio app, so you’ll end up bouncing between apps anyway to get decent world news coverage. ▪️They haven’t updated in about half a year. I feel like this app is gonna be abandoned & go to seed very soon.